Arrowhead Country Club, conveniently located in Myrtle Beach, is one of several Myrtle Beach golf courses that offer 27-holes. This masterpiece is located along the scenic Intracoastal Waterway and was designed by the team of PGA Hall of Famer Raymond Floyd and Tom Jackson. This captivating facility offers beautiful Bermuda fairways and MiniVerde Bermuda grass greens with a design that will not only challenge golfers of all abilities but will leave each player with a lasting memory of the outstanding waterway vistas. Arrowhead has three nines to choose from; the Waterway, the Cypress or the Lakes with the Cypress and the Lakes being the most popular. The National Golf Course Owners Association awarded Arrowhead the South Carolina’s Golf Course of the Year Award. 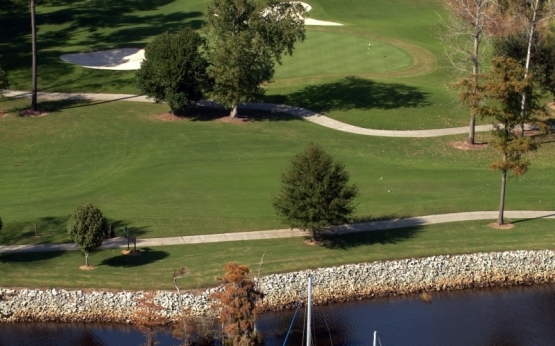 On your next Myrtle Beach golf package be sure to include Arrowhead Country Club with any of our other beautiful Myrtle Beach golf courses to make a life long memory that you are sure to want to repeat year after year. When visiting South Carolina on your next vacation be sure to check out many of the other Myrtle Beach attractions. This is an awesome establishment. Beside the course being phenomenally challenging AND fun... the staff was very delightful. From the pro shop staff to the marshals, they were all very courteous and helpful. No doubt this course is on my radar every time I'm in MB. Great layout. Staff was very friendly. Course conditions were terrific. Will definitely play again!